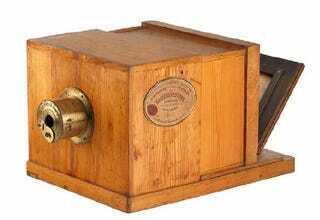 Daguerreotype cameras are the great-great-great-great-great-great-great grandfathers of the devices we use for snapshots today. Recently the earliest—and with an expected price of 700,000 euro, the most expensive—examples of such a camera was rediscovered in a private collection. If you've got between 200,000 euro, the auction's starting price, and 700,000 euro, the expected final price, and a weakness for old, wooden sliding-box cameras then this one's for you. It's got the signature of its name sake, Jacques Mande Daguerre, and was actually built by his brother-in-law.